On Sunday we posted about the Symbian Belle site which our readers informed us has actually been there since Belle was launched. Fortunately, we weren’t the only ones to think this as new as many other blogs also posted that story later on. In that article, there was a compatibility list for Symbian Belle, listing out all the current Symbian^3 handsets, except that is for the recently announced Anna handset, Nokia 500, as readers 352×416, nismo, himanshu and Timbe asked about. 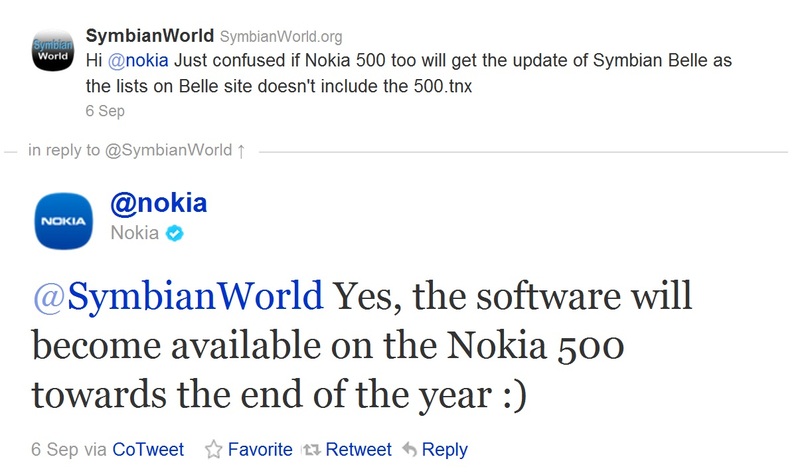 The Nokia Twitter account says however that Nokia 500 will get that software update. However, there’s possibility of a mistake as has happened before (e.g. saying new N8s were shipping with Anna already ) though there is less room for misunderstanding here. « Video: GSM Arena’s Nokia C2-03 dual sim S40 touch and type slide hands on.